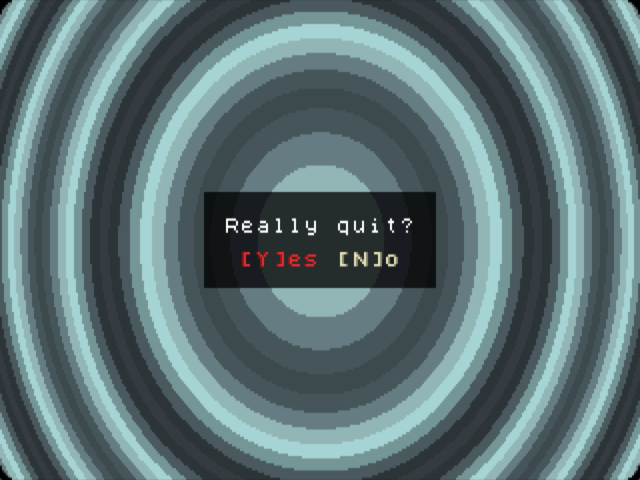 A simple puzzle game. Initially it fit into just 8 KiB, then grew to 16 KiB and then 23 KiB, now it's a 25 KiB file for DOS, the 3DS version is 242 KiB and the PSP version is 640 KiB (due to homebrew packing in lots of standard library files; the size could be optimized, but I decided not to). 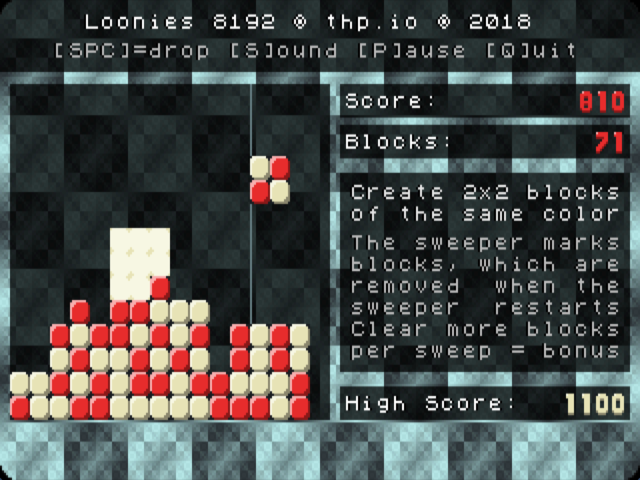 How to play: There are 2x2-blocks falling down the top, with two different colors. Use LEFT/RIGHT/DOWN to move the block and use UP to rotate it. Use SPACE to drop the block (it will fall fast until it lands). For the 3DS, you need to be running the Homebrew Launcher, for the PSP you need to install Custom Firmware (CFW). For DOS, you just need a Retro PC or DOSBox, PCem or similar emulators that emulate a DOS VGA machine. 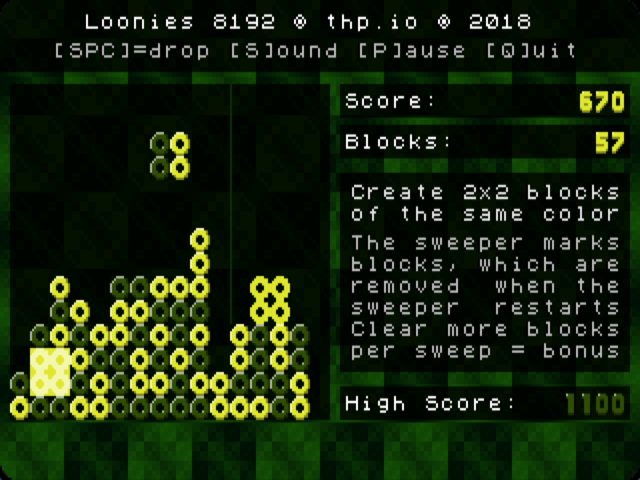 By default, Loonies 8192 has synthesized sound built in, but it's possible to also use CD-quality audio files. 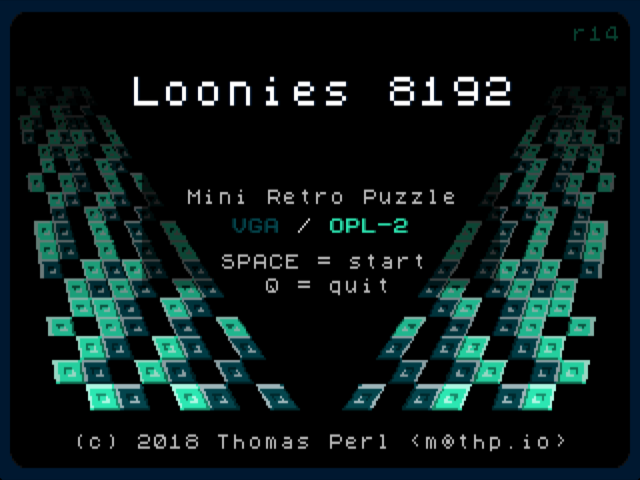 Download the "Loonies 8192 Sound Pack", and put the WAV files on an Audio CD (for DOS) or in the game folders for PSP and 3DS to upgrade your sound experience to fully sampled 16-bit audio! There's in-game help now on how to play the game. You can configure the language, soundtrack and difficulty level in the options menu. 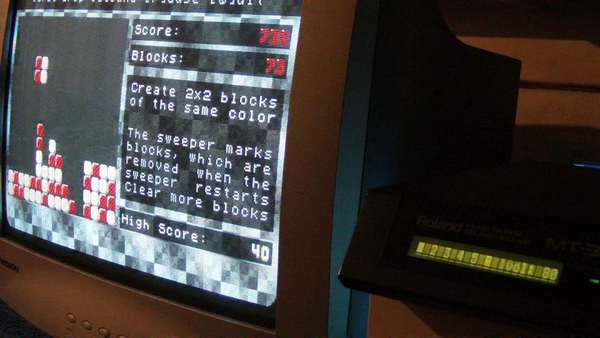 For DOS, the options menu also allows to choose between PC Speaker, OPL-2, MIDI and CDDA. 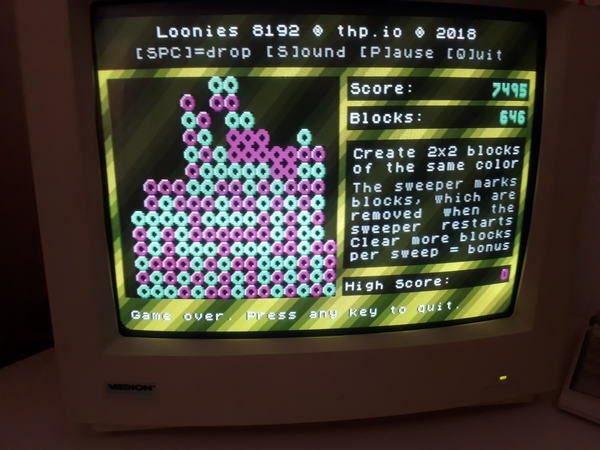 Here are some pictures from Vogons forum users that ran the game on their hardware, thanks to: Eleanor1967, amadeus777999 and Jo22. Also to the following people for testing: root42, K1n9_Duk3, Kamerat and blurks. 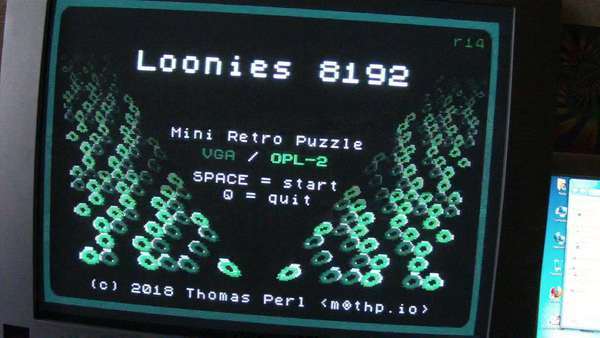 The last one is a Roland MT-32 attached via SBMIDI, as the latest version of Loonies 8192 has support for General MIDI via both MPU-401 (UART mode) and SBMIDI interfaces. 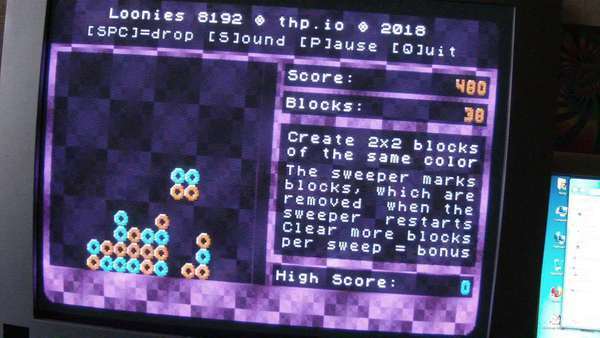 Of course, the point of this exercise is experiencing it on real hardware, but failing that, you can listen to two different renditions of the songs in this game here, one with OPL-2 music being played back by a Yamaha OPL-3 chip on a Sound Blaster 16 and the other with General MIDI music being played back by a Roland SCB-7 WaveBlaster daughterboard on the same SB16.